Ahmad Danny Ramadan, The Clothesline Swing: A Novel (Gibsons: Nightwood, 2017). Paperbound, 288 pp., $21.95. Reading this remarkable, debut English-language novel marks—as it will for many readers—my first encounter with the fiction of Syrian-born Ahmad Danny Ramadan, who has published two notable collections of short stories in Arabic. Ramadan is also the English translator of 1000 Lashes: Because I Say What I Think, a collection of texts by Raif Badawi, currently imprisoned in Saudi Arabia for his anti-government blogging and his advocacy for freedom of expression. 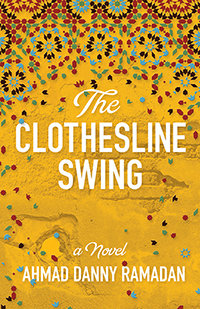 The Clothesline Swing is not a polemical or political novel, tending more toward sensuous fiction-making around love, loss, and certain forms of escape; Hakawati, our narrator, at many moments depicts himself as a story-telling escape-artist. His name, he tells us, marks him as “a storyteller, … a fabulist, a writer, a hakawati,” an updated Damascene Scheherazade, but gender-flipped and queer, telling tales as a stay of execution, not at the hands of some medieval Shahryār but as a potential casualty of war or as a survivor of gay-bashings. Ramadan’s style, despite its sometimes stark subject matter, has a slightly elevated formality reminiscent of another gender-bending raconteur, Isak Dinesen, a self-translator into English of tales about displaced souls; Ramadan’s seventeen chapters are each carefully framed narratives, embedding lush, fragmentary stories of Hakawati’s past in the novel’s present day—a half-century in the future, though this is more rhapsody than speculative fiction—as the writer attends to his dying lover, telling anecdotes of his adolescence or of their formative days in Syria. The delicate estrangements of this closeness inform a kind of listening, which is what the novel, I think, ultimately wants to activate in its readers. “What’s a storyteller without a listener?” Hakawati asks Death itself, who—along with a series of other spectres and presences—haunts the kitchen and bedroom of their shared Vancouver apartment, reminding us that the stories unfold not as accounts of a lived past but as supernatural delays, as stays against the one final loss—which Hakawati cannot quite bring himself to narrate—of his lover. The poise and power of Ramadan’s writing lies in the careful, seductive orchestration of the stories he chooses to tell, and in the deep and lasting empathy for the marginalized and displaced, for the loving and the beloved, to whom he gives voice.